Several Portland food bloggers and enthusiasts (myself included) have been gathering annually in December for the Obscure Holiday Cocktail party for SIX years now. At first, the cocktails actually were obscure holiday cocktails, meaning retro, traditional, and forgotten. Then the featured cocktails veered, with varying degrees of success, into holiday peppermint and pine flavors. Finally, in Year 6, the participants have settled into a routine of unique and tasty cocktails. This year's party featured light and refreshing gin and grapefruit cocktails; a warming spiced tea and rum toddy; and a hearty single malt whiskey, absinthe concoction. A fantastic, hard hitting boozy eggnog ice cream even made an appearance. I contributed this Red Nose Punch from Saveur, which I found on a Pinterest board titled "Big Batch Cocktails to Get Your Family Drunk on Thanksgiving." Still one holidays to go, so substitute "family" with "friends" and make this punch for New Year's Eve. It's tangy and fizzy, but not so alcoholic that no one will make it to midnight. 1. Arrange mint leaves in pairs in the bottom of a silicone bundt pan. 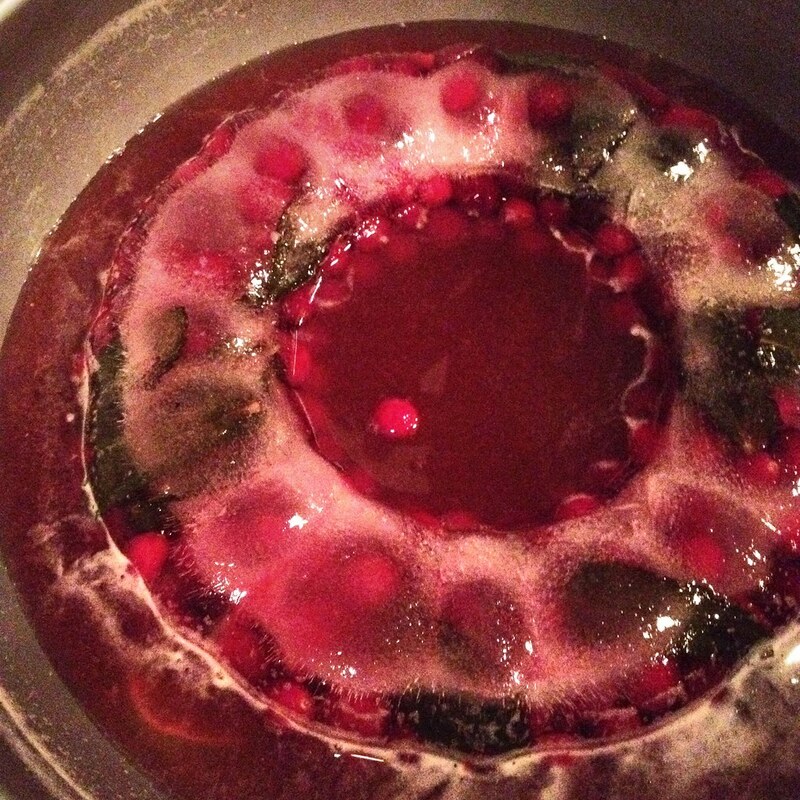 Cover with 2 cups cranberries. Pour over 4 cups hot water; freeze overnight (the hot water will allegedly freeze clear; this did not happen to me). 2. Combine shrub, bourbon, and lime juice in a large punch bowl; stir to combine. Unmold frozen ice ring and float in punch; top with beer and sliced limes.